I hope you will find these healthy juicing recipes inspiring. Just because they’re healthy recipes it doesn’t mean they’re boring in actual fact some of these healthy juicing recipes are the most delicious. What could be better than a tasty treat that’s also providing you with a few health benefits thrown in. There is nothing more naturally good for you than the vitamins and minerals you get from fresh fruit and vegetables. They provide a boost to our immune system that can help us fight common illnesses, aid us in recovery from more serve health problems and overall give us a feeling of well being. Juicing is just one way that you can benefit from all this, by juicing fresh fruit and vegetables in their raw un-cooked state. Juicing is a way to give variety to your diet and allows you experiment with fruits and vegetables that you perhaps wouldn’t normally try or eat on their own. Many people state that the more variety of fruit and vegetables you have in your diet the more healthy your daily diet will be as you’ll intake a wider variety of vitamins and minerals. Here are a few of my favourite healthy juicing recipes that I hope you’ll enjoy. This powerful drink is packed full of rich iron, which is essential for carrying oxygen around the blood. 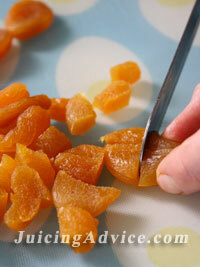 Finely chop the apricots and cover with boiling water for about 10 minutes. Finely chop the pumpkin seeds and roughly chop the carrots. Drain the apricots in a sieve. Pass the spinach, apricots and carrots through your juicer. Stir in the pumpkin seeds, kelp powder, and lemon juice and add a little mineral water. This colourful juice provides an excellent boost to the immune system. Ginseng is claimed to help reduce tiredness and stress as well as boosting the immune system. Start by cutting the pumpkin in half removing the seeds. Skin and roughly chop the pumpkin flesh. Deseed the pepper and chop. Remove the stone from the apricot and chop. Pass the pumpkin, pepper and apricot chunks through your juicer. Add the ginseng powder and a splash of lemon juice. Stir well and serve over ice. The combination of carrot and citrus fruit in this juice provides you with a wealth of vitamin A, which aids healthy vision. As well as giving you vitamin C to boost your immune system. Give your carrots a good scrub or peel them to remove any chemicals that can occur on commercially produced carrots, and then chop. Peel and break up the segments of the clementines. Pass the carrots followed by the clemintines through the juicer and serve. This is a great immune boosting juice full of vitamin C that will help you stave off winter colds. It also contains folic acid that’s reported to have cleansing properties for your digestive system. 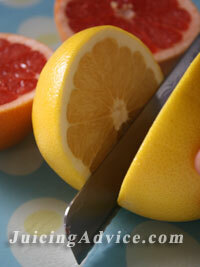 Cut the citrus fruits in half and squeeze out the juice by using a citrus juicer. This drink should not only provide you with an instant energy boost it will also help give you healthy looking skin. Slice your melon in half and remove the seeds, then cut in quarters to remove the skin. Chop the melon flesh into chunks. Core and chop the apple. Pass all the fruit through your juicer and finally stir in the lemon juice. This is a great juice drink if you’re trying to fight off the common cold. It’s also full of antioxidants than are reported to help us to protect our bodies from more serious illnesses. This juice can be easily made in a blender. Halve and scoop out the flesh of the passion fruit straight into the blender. Squeeze the orange straight into the blender using a hand held juicing tool. Half the mango and remove the stone and skin, roughly chop the flesh and add to the other ingredients. Core and chop the apple. Whiz everything together until smooth in the blender. Stir in the Echinacea and serve. 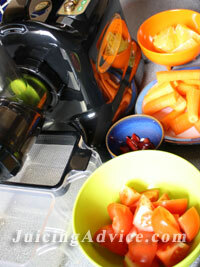 For more of my favourite healthy juicing recipes don’t forget to visit my page on vegetable juicing recipes.